My roommate Hilary is obsessed with figure skating, and is watching the currently airing Junior Grand Prix. The competitions she’s watching keep crossing over with video games. Last night, as she watched the competition and I did laundry nearby, I looked up at the screen, and stopped what I was doing, in shock. “That’s Lara Croft,” I said. Russia’s Polina Kostiukovich and Dmitrii Ialin were indeed skating to a remix of Destiny Child’s “Survivor,” which had been used in the trailer for the Tomb Raider movie. They were decked out in sparkly blue tanks, each with a red armband, and black pants. It appeared as though they were both in Lara Croft cosplay. It was kind of amazing, and after their performance, they shot up to the number one spot. They weren’t the only skaters to do an homage to Tomb Raider. 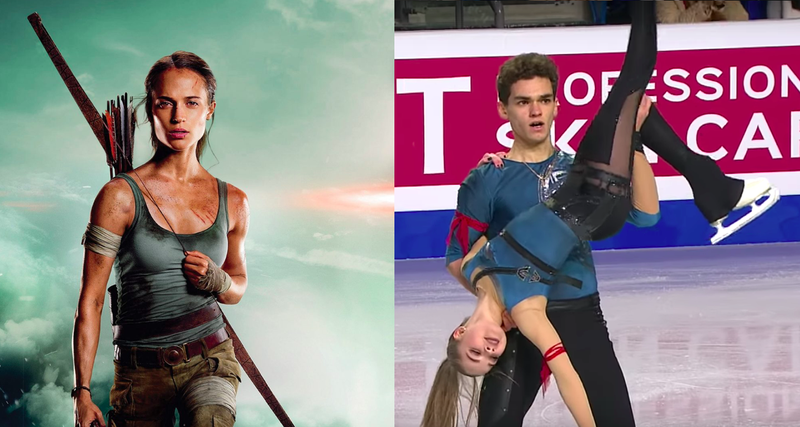 Last month, during a Gala event where skaters can skate to whatever they want, Russia’s Alina Zagitova also skated as Lara Croft. During the the NHK Trophy’s Gala, Latvian Deniss Vasiljevs skated as an assassin from the Assassin Creed franchise, using music from the trailer for Assassin’s Creed Revelations. He described his skate as representing a “very dark soul-harming moment.” Okay! This was another bizarre moment where I was casually eating dinner while my roommate was watching skating, looked up at the screen and did a double take. Figure skaters are a bunch of nerds. Extremely athletic, driven nerds, but nerds nonetheless.